It's almost time for stairs! Let’s talk about stairs. I have a deep complicated love for stairs. They are painful, but they get you somewhere. The good thing about life (and this climb) is that it's not merely a series of endless steps; occasionally you get (water) breaks, and often times you have breakthroughs (turn corners). There are also times when you are so tired and it is too painful, you feel that you are unable to go on. But if you are open to it, this is when the inspiration comes to climb faster, and work harder, to keep reaching. I sit here trying to figure out how to tie my fancy stair metaphor to those who have been affected by Leukemia and Lymphoma. And while I do believe that during their time of diagnosis they experience pain and growth in extremes that I may never understand, but it isn’t and doesn't feel like a fancy metaphor. Life isn’t always easy for any of us, but all I know is wherever we are, we can keep climbing. Again my race, and your donations, are dedicated to Chris and Sandy whom are both in remission. 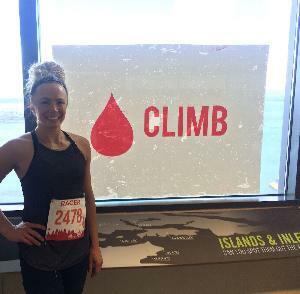 Thank you for supporting this cause that has helped these two woman on their ‘climb' with Leukemia and Lymphoma. Please click here to donate to my big climb on March 24th. Participant has reached $2,500 in fundraising earning VIP status!